A few weeks ago I was lucky enough to receive some samples from a company I thought I had never heard of before. I couldn't wait to try out the nut-free, soy-free, gluten-free, no high-fructose corn syrup or hydrogenated oil free peanut butter alternative. Made from golden peas? I didn't know what to expect. I was absolutely delighted at how good it tastes. 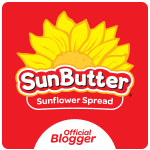 My daughter just shared some with her peanut butter loving friend, Kaykay, and she thinks it's great too. I must say it is DARN TASTY! Creamy NO-NUT BUTTER, distributed by the Sneaky Chef Foods, LLC., Irvington, NY 10533. 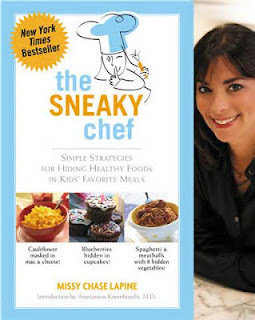 Let me add that when I saw the packaging, I realized why 'The Sneaky Chef' had sounded so familiar. I had purchase Missy's cookbook, The Sneaky Chef, a few years ago. I love all of the healthy ingredients she uses in her recipes. Now that school is over and my crazy springtime schedule is behind me, I plan to have some fun experimenting with cooking and baking this summer! Can't wait to fill you in on how the Smooth Red Pasta Sauce with 8 hidden veggies tastes in one of my dinner surprises. Just may make lasagna for the first time in years! !